E.C. at his very best, playing rock/blues as only he can, every track Brilliant. Awesome! Nothing but. I have been a die-hard EC fan since 1972 and I think this is some of his best work, no doubt. From the first time I heard this record till the present, I knew this was a very special one, indeed. Time after time, Eric always is amazing with his song writing, guitar work, improved production, and yes, vocals! I think those of us that have seen EC live, know how special and talented he truly is. Can't say anything bad about this record. The least favorite track to me is Hound Dog and the most are the other 11. I have seen EC live 7 times and hope to see him even more. Not everything is perfect but it's as close as one can possibly do. I would like to know of any other musician of his calibre who is as old and has been thru so much as EC, and still writes and performs. Thank you for the years of some of the best music in history. Keep on, keepin' on, EC, you're the greatest! 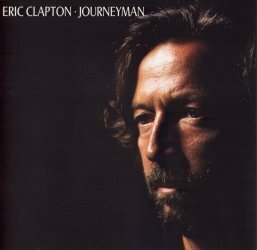 I had always been reluctant in buying this album because I knew it was one of Clapton's more "commercial" albums. I AM glad that I recently bought it though. This album may have some bad songs but I think the other songs make up for it ten-fold. Hard Times is a great song and emotionally charged which is something Clapton should always do. Its not hard to believe that I also like the lyrically pushed Hound Dog, though I think he could have done a bit better with the choice of soloing, but hey, it is a studio album. No Alibis is good but a little bit too mechanical. Less is always more when it comes to music and that is proven here, there seems to be a bit too much going on here and even Eric's solo seems to have a bit of a machine like feel to it. The best song on the album I think is Old Love. Eric and Robert Cray work very well together and that is clear on this song and on Before You Accuse Me. Old Love has always been a favourite of mine and I think the guitar parts on this version were phenomenal. This is a great album very much worthy of being bought. A tremendous effort from the master at a much needed time, the end of the hum-drum eighties. Not a bad tune in the lot. I love the opening of Pretending. Running on Faith is a masterpiece! Journeyman is a masterpiece. One of the top three albums of his career. It starts with the Classic "Pretending" where EC uses the wah wah to perfection. His guitar is probably his strongest since Layla CD. "Anything for your Love" sounds like an experiment but has a charm of its own. He then does the classic "Bad Love" where again he uses his patented wah wah and Nathan East offers some very strong base lines. Nathan East at this time is playing the best bass of his career. The Combination of Clapton and East is outstanding. My personal favourite on the CD is "Running on Faith" which is outstanding. There is another version on his "Unplugged" CD. This remains one of my favourite Clapton songs EVER. Next he does the Big Mamma Thornton Classic "Hound Dog which has the original lyrics not the lyrics that Elvis used. Clapton's version to me is bluesier and much better than Elvis'. Next is "No Alibis which again he uses the wah wah and has a strong solo. It is EC playing at his potential. Next is the George Harrison duet "Run so Far" which also appears on Harrison's brainwashed CD that has just come out. It has a 12 string guitar. It is worth the listen. The finale is the blues standard "Before you accuse Me, it is a blues standard and has a strong blues solo. The CD shows some of the strongest guitar of EC's career. I was lucky enough to have seen him on this tour and it was outstanding, just like this CD. You will listen to this over and over. Another superb album from Eric. This album has a very "80"s commercial feel to it, but never the less the songs "No Alibis" and "Anything For Your Love" really does this album justice. So if one prefers something a little different from blues, then go and get this album - after all Clapton is God! This is one of my favorite Eric Clapton albums. I listen to it just about every day. Old Love and Running on Faith are excellent. Clapton's vocals are right there. Bad Love & Pretending are great rock and roll tunes. I also like the Hound Dog arrangement although I didn't when I first heard it. I bought the 24 Nights DVD recently and many Journeyman tunes are on it. It's great. I'd recommend that DVD to any Clapton fan. It's just like being there. This was the follow up to the commercially successful album, August. Once again as with the previous release, it was obvious that the record company were basically looking for an album that would harvest a supply of songs for issuing as singles. The fact that there were few self penned songs highlighted that EC had hit a bit of a drying up period with his songwriting. Eric called for the help of a few friends in the recording of Journeyman with Mick Jones of Foreigner who so wrote Bad Love, George Harrison who plays and sings on what I rate as the worst track, Run so far and the Womacks who with Lead me on aren't far behind. However it's Robert Cray's assistance for me that makes the biggest influence on this album. he co wrote the impressive 'Old Love' still a favorite live track of Eric's and he also plays on the blues standard, 'Before you accuse me' which brings this album to a close. Other notables to feature on Journeyman are, Chaka Khan, Daryl Hall and of course Uncle Phil Collins. Now let's be honest, Eric should be seen live to be heard at his best. there are few recordings that do any justice to the man's brilliance with the guitar, From the Cradle and Riding with the King being recent exclusions . So many times have I've witnessed what is basically a mediocre album track, turned into a absolute breathtaking experience when played live. And so it was that anyone lucky enough to see EC playing at the Albert Hall during the 24 nights residency during February 1990, remembers with fondness the pleasure in listening to the material from Journeyman, especially if like me they had the chance to be there for one of the Orchestral nights. Bad Love never sounded so good.